We are delighted to announce that we have appointed award winning Welsh chef, Hefin Roberts to join the Sandy Mount House team, as head chef. Hefin, who is currently executive chef at Bodnant Welsh Food Centre, was previously head chef at The Bull in Beaumaris, Anglesey, which under his leadership, gained three AA Star Rosettes, Best Restaurant in Wales and five Good Food Guide mentions. He was responsible for the menus and managed the kitchen teams in both The Loft (fine dining) and the brasserie at the venue. He also has experience as development chef working with Castell Howell Foods creating their high end food range. Sandy Mount House owners Louise and Phil Goodwin were keen to get a locally based chef on board early and were aware of Hefin. 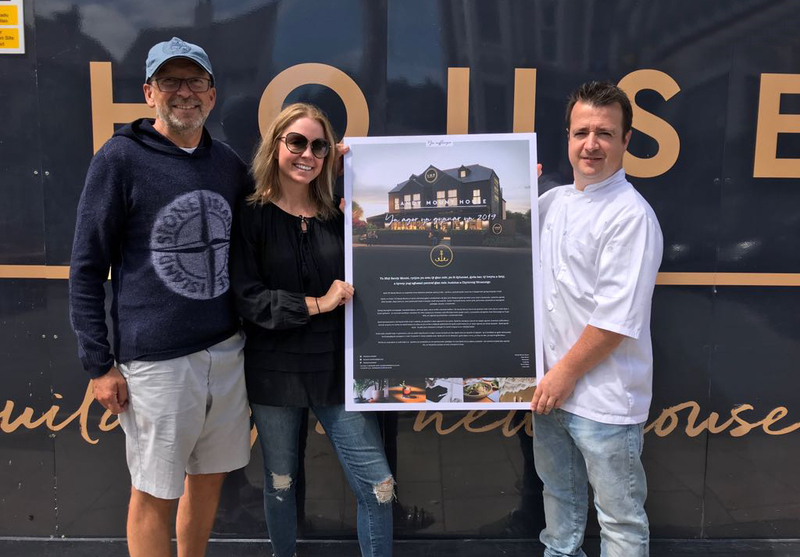 They met up, shared their plans for the site and took him round some of the venues that the project’s interior designer Michelle Derbyshire had worked on in Manchester to give him more of a flavour of what they were trying to achieve on Anglesey. Hefin became increasingly excited about the project and its potential, so he made the decision to join the team. Hefin Roberts said: “Hearing Louise and Phil’s passion around plans for Sandy Mount House was infectious. It certainly got me excited and keen to join the team. The opportunity to create something new is always a challenge relished by chefs. Once completed, Sandy Mount House will feature a 120+ cover stylish restaurant for relaxed family dining, a cool yet relaxed and welcoming bar, and seven luxury hotel rooms. The intention is that the restaurant will be open seven days a week offering breakfast, lunch and dinner along with afternoon teas and bar snacks. It is aiming to be a focal point for the village, through its offering of relaxed dining and drinking – with something for everyone. Kaushik said: “We are delighted to welcome Hefin. We’ve got a great team on board to support us in delivering Louise and Phil’s vision for Sandy Mount House. Hefin’s first challenge with us will be to develop an exciting and eclectic menu with a strong emphasis on supporting good quality local suppliers and produce. We look forward to seeing and tasting what he comes up with. Visit our recruitment page for more details and to apply.